Hitler and Stalin used it in concentration camps and gulags as mass control instrument to make the prisoners docile. For some years, the British Dental Association and their cohorts have lobbied MP’s to change the law to force water companies to fluoridate public drinking water supplies at the request of unelected health authorities, allegedly to reduce tooth decay in children. Last year, the Government produced a Green Paper, “Our Healthier Nation” which purported to deal with four main areas of concern. However, (as we predicted), tucked neatly in to the body of the document were a couple of paragraphs proclaiming the government’s support for water fluoridation. The Green Paper, (a ‘consultation document’) was priced at £310.30 and few members of the public will have heard of it, let alone know where to obtain it, or be able to afford to buy it. A White Paper is expected early this year. If it promotes water fluoridation there will be the Mother of All Battles because, unless the government is stopped, the White Paper will become a Bill, threatening the British public with mass medication without their consent. When the Water Fluoridation Act was passed in 1985, the final (ostensibly “free”) vote on the Bill was: For fluoridation 165; Against 82; Abstained 399. Even known anti-fluoridation MPs either voted with the Government, or abstained “against their consciences in order to keep their beloved offices, cars and salaries” (Hansard, 5 March 1985, column 936). Thus, the Bill became law on the votes of only one in four MPs and two out of every three members of the electorate were not represented in the final vote. Artificial fluoridation of public drinking water supplies is the longest, most expensive, most fraudulent and most unsuccessful marketing campaign ever to have come out of the United States. Robert Carton, PhD formerly President of the union of Government Scientists working at the US Environmental Protection Agency said: “Water fluoridation is the greatest case of scientific fraud of this century, if not of all time.” In 1997, more than 1,000 members of this union working at USEPA HQ in Washington DC, who are directly responsible for the US Safe Drinking Water Act, voted UNANIMOUSLY to ban water fluoridation. Their bosses are not listening. During the 1950s and early 1960s the United States Public Health Service gave millions of its own taxpayers’ dollars to promote the addition of toxic industrial waste fluoride to the drinking water of the UK, Ireland, western European countries, Australia, New Zealand and Canada. It would be naive indeed to believe that a beneficent Uncle Sam cared so deeply for the teeth of foreign children. Some European countries that tried fluoridation soon stopped it – others rejected it out of hand, because to add a known cumulative toxin to public water supplies is scientifically and medically indefensible. After a bitter battle in Holland, during which a group of general practitioners found that their patients suffered adverse health effects, fluoridation was banned in that country. Indeed, a new Clause was added to the Constitution of the Netherlands to prevent fluoridation from ever raising its ugly head again. It is alleged that artificial fluoridation of drinking water to one part per million – that is, one milligram of fluoride per litre of water – reduces tooth decay in children “by up to fifty percent”. Large–scale studies of the official school dental data of tens of thousands of children in the United States, New Zealand and Canada show that there is no difference in the incidence of decayed, missing and filled teeth between fluoridated and non–fluoridated areas. Like lead and arsenic, fluoride is a cumulative poison. We excrete about half of the fluoride we ingest. The rest is stored, mainly in the bones, where it increases the density but changes the internal architecture of the bone, leaving it more brittle and prone to fracture. There have been eight scientific papers published in reputable medical journals on the increased risk of hip fracture in elderly people living in fluoridated areas. In 1996 we brought Phyllis Mullenix PhD to meet with Gerry Malone, the former Minister for Public Health in the Tory government. Dr Mullenix was a senior toxicologist at the Forsyth Dental Institute, Boston. Her study found that fluoride has adverse effects on the central nervous system, leading to behavioural problems and lowering of children’s IQs. She was warned by her employers not to publish but, because of the serious implications for human health, she published and was sacked. The reason? Her work was “not relevant to dentistry.”! (Her findings have twice been confirmed by scientists in China.) Dr Mullenix won a substantial out of court settlement for wrongful dismissal a judgement not reported in the media. She is now an ardent campaigner against water fluoridation in the United States. Her visit to Westminster, by a barrister and flanked by Councillors, failed to interest the steeple–fingered Mr Malone. On 26 October 1998, we brought Professor Dr A.K. Susheela to meet with Ms Tessa Jowell, the present Minister for Public Health. Dr Susheela is a histocytochemist and a Doctor of Medical Science with 25 years experience in fluoride research and more than 100 published scientific papers on the adverse effects of fluoride on human health to her credit. She is a senior consultant to the Indian Government on the subject of fluoride toxicity. Dr Susheela showed Ms Jowell and three of her advisers Dr Michael Waring, Mr Ian Cooper and Mr Jerry Read – electronmicrographs of cells – how fluoride kills erythrocytes (red blood cells) and causes devastating damage to gastric mucosa, resulting in a collection of symptoms which we westerners describe as “Irritable Bowel Syndrome”. This condition if shown to be caused by fluoride, can be completely cured in 10–15 days by eliminating fluoride from the diet and drinking pure water with no fluoride contamination. She showed how calcium levels in the body decrease as fluoride levels rise. She showed photographs of how fluoride induces pitting and cavity formation on the surface of tooth enamel and that these cavities are distinctly different from those formed as a result of dental caries. She showed how blood fluoride levels rise continuously with prolonged use of fluoridated toothpaste. She showed how, in those who ingest fluoride-contaminated water and who use fluoridated toothpaste, mouth rinses, etc., the muscles, connective tissue elements (particularly the collagen fibres) and bone tissue undergo degenerative changes. We have called for a full, independent Public Inquiry before any further attempts are made to add fluoride to any further water supplies in the UK. The Inquiry must bring together all relevant scientific disciplines – biochemical and toxicological, medical and dental – and relevant legal and constitutional authorities, to rigorously examine all the evidence – which we can provide – over, say, the past twenty years. Government is ignoring this call and continues to promote artificial water fluoridation. We therefore accuse the Government and their “advisers” of criminal negligence and call for the immediate resignations of Ms Tessa Jowell, Dr Michael Waring, Mr Ian Cooper and Mr Jerry Read. The British Fluoridation Society Ltd (a body funded by the Department of Health with taxpayers’ money to promote water fluoridation and whose directors are members of the British Dental Association) should be wound up forthwith and its President, Vice Presidents and directors called to account at a Public Inquiry. One of its Vice Presidents is Lord Colwyn – a dentist. Another is Robin Cook, the Foreign Secretary. In August 1995, an NPWA campaigner received a reply from an official at the Dept. of the Environment: “There would appear to be no UK or EC standard for the discharge of fluoride to the environment … but it is regarded as a dangerous substance under the EC Dangerous Substances Directive? Id as such pollution by it must be reduced …. Research is to be carried out to define acceptable limits for fluoride (for discharge to sewer and in treatment processes) in the future but when such work would be complete and published is indeterminable. Artificial fluoridation chemicals have never been scrutinised by the Medicines Control Agency.” NO surprise the stuff is toxic industrial waste. Just as worrying is fluoridated toothpaste, which also escapes the MCA and instead, comes under the auspices of The Cosmetics and Toiletries Association! 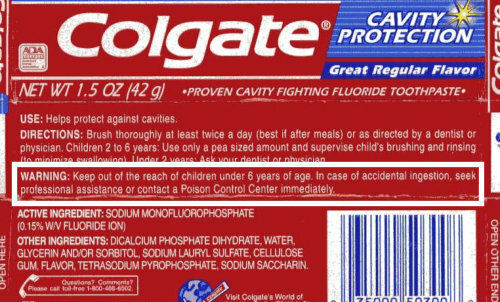 But in May 1997, a United States Food and Drugs Administration directive came into force, that fluoridated toothpaste must carry the following warning: “If you accidentally swallow more than is needed from brushing (sic) seek professional help or contact a Poisons Control Centre”. 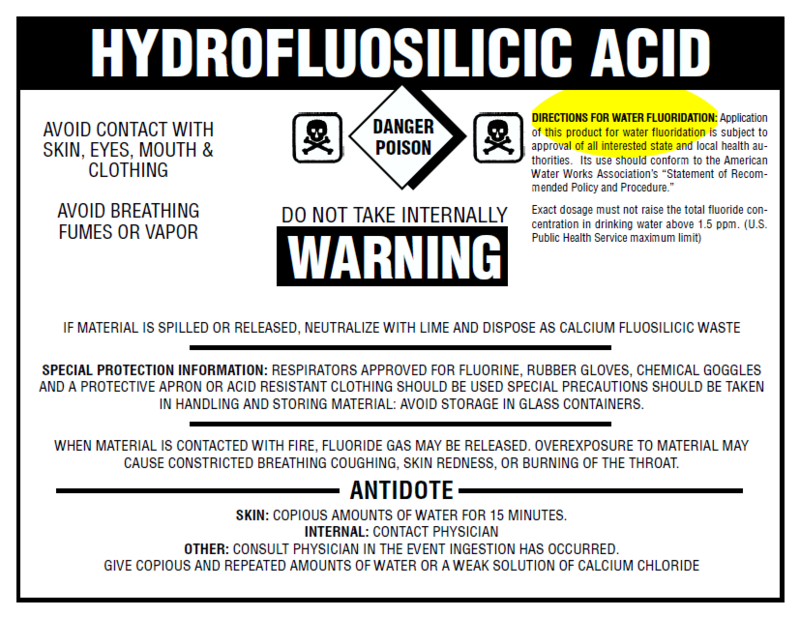 The American Dental Association went ballistic – they make $MILLIONS from 11 accreditation” of fluoride products and I certainly didn’t want to see a Poisons warning on their nice “clean” mega-buck earner. As a matter of interest, what is the difference between a half–inch strip of toothpaste and a pea–sized piece? Answer: DEGREE OF TOXICITY. Incidentally, the British Dental Association and the British Dental Health foundation also make tens of thousands of pounds annually in “accreditation” of similar products. (Check your toothpaste box. And why are you still giving it houseroom? Example just below! Dr Phyllis Mullenix warned them. Professor Susheela warned them. Dr Peter Mansfield warned them. And a whole array of international scientists warned them. The NPWA has warned them umpteen times since 1960 when Lord Douglas of Barloch founded the Association. In areas where so–called “public consultations” have been held, elected Councils and the public have massively rejected water fluoridation – in some areas up to four times! We call that public harassment. In the face of the latest attempt to poison the drinking water supply we must all join together and tell the government that ENOUGH IS ENOUGH. The legislation which permits water fluoridation must be REPEALED. That is why we called for a full, independent Public Inquiry. But the government appears to be suffering a bout of profound deafness and the fluoridistas are dead against such scrutiny – only too eager to pass up a golden opportunity to show us to be the “cranks and crackpots” they say we are! Dr Mansfield said: “No physician in his right senses would prescribe for someone he has never met, whose medical history he does not know, a substance which is intended to create bodily change, with the advice: ‘Take as much as you like, but you will take it for the rest of your life because some people say that it can reduce tooth decay in some children.’”” It is a preposterous notion. Write immediately to your MP and demand an INDEPENDENT Public Inquiry into water fluoridation. Write to your water company and tell them that you do not consent to the addition of artificial fluoride to your water supply and that THEY should support the NPWA’s call for a Public Inquiry. Write to your local Council and ask them to support Councils in Lancashire, Cumbria, Yorkshire, Leicestershire, Northern Ireland and Scotland by rejecting water fluoridation and to support the NPWA’s call for an independent Public Inquiry. Write to the Letters column of your local newspaper to alert the public to the scam which is being perpetrated by the Department of Health. Expect a huge propaganda campaign to reinforce the belief that the cumulative, protoplasmic poison “fluoride” is not only good for teeth – they are now saying that it is good for general health throughout life! Try telling that to edentulous, arthritic grandparents living in the West Midlands or the North East. And how can the DoH square such claims with the following (accurate) statement which appears in their “Report on Health and Social Subjects; Dietary Reference Values for Food, Energy and Nutrients”, (HMSO, 1994, 1996, 1998): “No essential function for fluoride has been proven in humans.”? Remind your elected representatives that you did NOT give them the right to medicate or treat you against your will, whether via the drinking water or by any other means. Everyone has the right to determine what they will and will not put into their own bodies in order to maintain life, to promote health and the prevent disease. Not even a doctor can compel us to take his prescription. Elected representatives have a duty to protect the rights of their constituents. The only way that elected representatives can protect those rights is by voting NO to water fluoridation. A vote for fluoridation is a violation of individual rights by arrogant, ignorant people with totalitarian mindsets who are manifestly in dereliction of their duty and are unfit to represent the people. Join the National Pure Water Association. Send a large sac with 31p stamp for information to NPWA at 12 Dennington Lane, Crigglestone, Wakefield WF4 3ET. New Group: London Against Fluoridation (LONDAF), PO Box 5267, Whitham, Essex CMS 7ED. Email: londafl@aol.com – website to be launched shortly.